Traditionally a product for graders and some retailers, mixed rags are products that normally have been through thrift and second-hand retailers in North America. 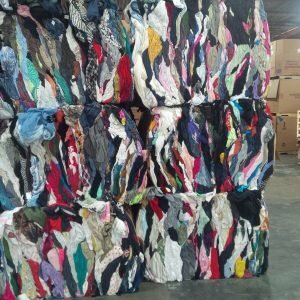 Mixed Rags are sorted donations that have either been sorted or not put on the retail floor and/or have been placed on the sale floor and not sold after a certain length of time. 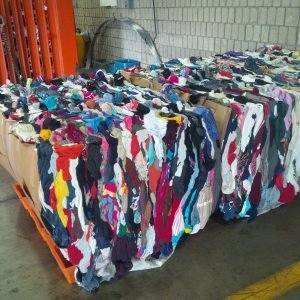 The clothing that is not suitable for their stores or that is unsold after being in their stores make up the “mixed rag” sort, ready to buy in bulk for resale. Mixed Rag (also called Institutional Grade) is a grade of used clothing generally produced by second-hand and thrift stores. These retailers have already sorted out used donated clothes that are in near-new, resalable condition. The clothing that is not suitable for their stores or that did not sell after being in their stores (known as store returns) make up the “mixed rag” sort. Contact our team for more details or to place an order. As an importer, Bank and Vogue is fortunate to have a vast array of highly-capable supply partners and active customers for these traditional used-goods products. On the supply side we work across most states and provinces in the U.S. and Canada, dealing with large and small thrift store retailers; not-for-profit, community-based collectors and private collectors and consolidators. Our Mixed Rag suppliers bale the product in 1000-pound (approx.) bales for transport in both trucks for domestic shipment and containers for exporter markets. The target weight for full loads of baled mixed rags is a minimum of 40,000 pounds, while loose mixed rags loads have a minimum target weight of 30,000 pounds. Our customers span five continents across a wide variety of retailers, graders and wholesalers. We have multilingual staff who are sensitive to cultural and linguistic differences. You can leverage Bank & Vogue’s experience in the mixed rags business, knowing you’ll be dealing with professionals who are 100% committed to your satisfaction. By special order, some of our suppliers can produce export loads of loose (not baled) Mixed Rags. If you prefer or require loose loads, be sure to let us know so that we can source exactly what you’re looking for. Bank & Vogue is committed to helping solve the Crisis of Stuff, a worldwide epidemic wherein clothing and other consumer goods are ending up in landfill and causing strain on the environment across the globe. Mixed rags play a very positive role in alleviating this crisis. Some mixed rags find a new home in their current iteration, while the other part gets repurposed into fiber that can be used in a variety of applications from insulation to carpet padding to filler for furniture. By encouraging the recycling of materials like mixed rags, we are diverting waste from landfill, and encouraging what’s become known as the Circular Economy. Contact Bank & Vogue today for further details on shipping and other logistics, and to get your order in and underway. Do you buy or supply used goods? I have read and I understand that Bank & Vogue only buys and sells used goods in bulk (a full trailer or container). All shipments contain a minimum weight requirement (30,000 pounds for loose clothing; 12,000 pounds or more for other products). Sign me up for your newsletter to get the newest market information and offers!